It’s exactly three months today since I arrived in Uganda. I cannot believe how fast the time has gone and that my adventure is nearing an end. I have had the most incredible trip that has shown me the best side of human nature from kindness to generosity and love to the worse side driven by poverty, greed and corruption. I’ve adapted my London lifestyle and have embraced being tee-total; enjoyed eating local food twice a day and have picked up some common and useful phrases in two dialects (Swahili and Lugandan). Today I’ve decided to take it easy after hectic day being a tourist yesterday. I’ll probably find a hotel pool in a few hours’ time and try to even out my body colour. I have a ridiculous farmer’s tan and the parts that have not had regular sun exposure are three shades lighter than the rest of me. Yesterday I managed to hit three landmarks in and around the city. First stop was the Gaddafi mosque. 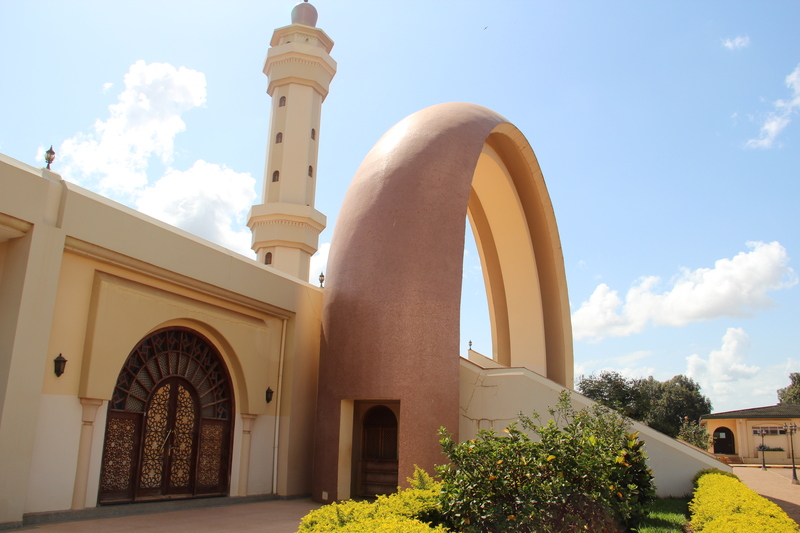 A beautiful structure based in Kampala old town which overlooks the entire city. Materials and craftsman from Libya, Morocco, Egypt and Uganda have all been involved in the finished product. It took four years to build and was completed in 2007, that was also the last time Gaddafi came to visit. It must have cost a fortune to build. I arrived sweating profusely after walking 5-miles to get there. And of course being a mosque I had to be covered up before being allowed in. Even though I was dressed very modestly I was still bundled up like a mummy before being given access which made me even hotter. The mosque is open for prayers twice a day on a Friday and women are allowed in to pray but only on the balcony upstairs away from the men. Tourists are welcome outside of pray times. The small tower to the left of the mosque is used for the call to pray, which is played out from a speaker suspended on the roof. My guide (Mahmoud) and I clambered up the spiral staircase – there are roughly about 150 steep, narrow steps half way up the tower to the first level. The panoramic view was impressive as the whole of Kampala lay sprawled out in front of us. Mahmoud pointed out the various districts that I have spent time wandering through and also gave me some history about the city and how the mosque came to be built. An hour later I was on my way down a hill to find a matatu to Kasubi. 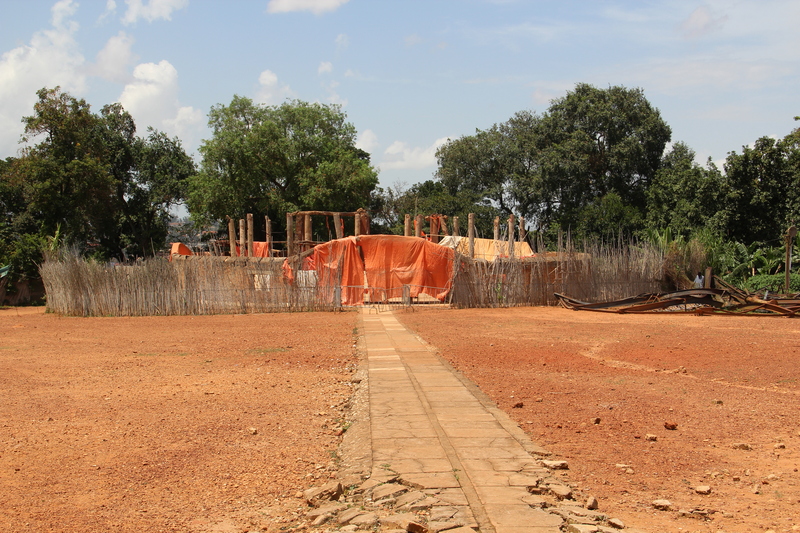 Next stop was the Bagandan Tombs, a world heritage site, in the village of Kasubi about 3 miles from the city centre. Four Bagandan Kings are buried here, dating back to the early 1800s. The structure which used to hold the tombs was burnt to a crisp after what’s believed to be an arson attack in 2010. The people say they think it was linked to terrorism because of Uganda’s role in Somalia, an investigation into what happened is ongoing. The tombs were undamaged and the bodies of royalty exhumed and moved to another thatched area while the structure is being reconstructed. Funding from UNESCO has been secured and building work is due to start later this year. 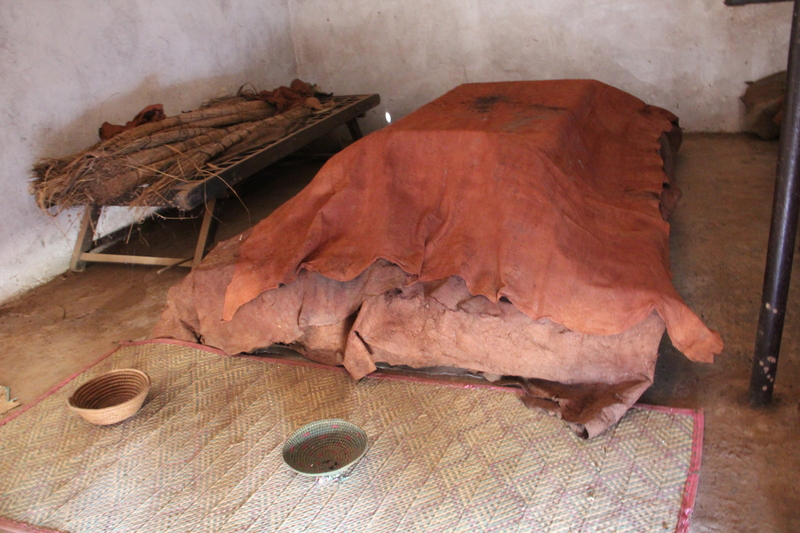 Today visitors get an opportunity to peer behind a curtain of Bark cloth to see the tombs which are now covered up until they can be restored to their original place. I am not a fan of tours I don’t like to be herded about in a large group and I often find the information I need to know is written on plaques or literature handed out. I think guides merely bang on a tad too much to make the tour seem worth the price. On arrival at the site a young man named Joseph was sat seated at the entrance. He approached me as I entered. “How much is it please?” I said. “It’s 10,000 entrance and another 10,000 for a tour,” he replied. “Wow that’s expensive. I don’t want the tour, I just want to have a look around and take pictures,” I replied. “Really…you don’t let people just come in and wander around?” I said somewhat sceptically. “So entrance is 20,000 then,” I said suspiciously. “No entrance is 10,000.” He repeated. Something didn’t seem right to me. Perhaps it’s a language thing, I thought to myself. As I was shown into the office I was greeted by another man. “Any chance of student discount?” I said producing my ID. “It’s 10,000,” said the official. “OK fine and what about the guide, ”I asked. “He’s outside, he’ll take you,” the official handed me my receipt. “So how long is the tour going to take?” I asked Joseph. “I want the salient points and not the drawn out version. I don’t want an hour ok?” I said to Joseph. “Yes Madame, no problem,” he said motioning to the chair for me to sit. A potted history about Uganda and the royal family ensued, which was genuinely interesting. I was the only visitor there at the time so thankfully the spiel didn’t drag on. All this took place surrounded by art work and paintings. Then I was taken outside to see the destroyed palace which was a heap of rubble and broken concrete framework, followed by two rooms in different thatched houses. The first house contained the exhumed bodies of the kings with their spears; the second was where ceremonial drums used for communication were kept. Outside in the grounds there is also a royal cemetery where next of kin lie. As the tour ended, Joseph led me back to the hut where the paintings were to sign the visitors’ book. I told him I didn’t want to buy a painting following a lot of nagging. After scrawling something complimentary I reached inside my wallet to give him a tip. “Uh-uh…..that man said the entire ticket was 10,000,” I said pointing to the room next door. “The tour is 10,000,” he said aggressively. I leaned my head out of the office into the area where the art work was hanging, while balancing on one leg and holding the frame of the door with both hands. “It is 10,000,” he said nodding. “So tipping is discretionary then and not 10,000,” I said. It seems “my friend” tries to make a fast buck by over-charging tourists who are non-the-wiser. The fact he lied about his position really p***d me off. His attitude is all foreigners can afford to cough up any amount of dough and despite me offering him a decent tip, he still wanted 10,000. He gaze had fallen to the floor where it remained. I know why he does what he does, and I can’t entirely blame him for trying to get more money the only way he knows how. But the problem is he is not alone and after three months of people continually trying to bleed cash out of me it gets tiresome. Plus I am nobody’s fool! “Here,” I motioned to the tip, still wanting to show some gratitude for his time. “I don’t want your money. You can go!” he said annoyed pushing the notes back towards me. I stomped out, really cheesed off. After a very long walk to Wandegeya to cool off and also going over in my mind whether I was too harsh on him, I boarded a matatu to Gayaza. 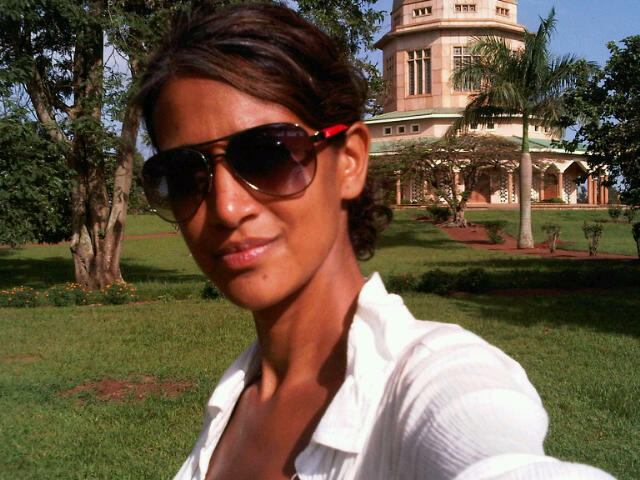 Off the busy highway is the only Bahai temple in Uganda and I’m told the whole of Africa. It was built during the 1950’s. It’s a long 30-40 minute walk up hill to the temple; its green dome just poking out through the treetops on the hill. Why do places of sanctuary make you struggle before you reach their gates? Is it to make the journey all the more worthwhile? The temple is beautiful and the surroundings are so peaceful. A professor in England recommended I go and switch off there in the tranquillity of the perfectly maintained gardens. His description of the places was dead accurate and I am so delighted he told me about it. It’s difficult for me to switch off as my brain is always on stand-by and rarely unplugged. But after a couple of hours of quiet contemplation in the shade of a big old tree, I think I did what’s called relaxing and I may have even nodded off for 30 minutes. The all-day walking in the blazing hot sun had clearly taken it out of me. The climb down was far easier and as I made my way back to the highway, it dawned on me that very soon I’ll be back to my old routine in London, which made me feel a little sad and somewhat anxious about the culture shock I’m going to get going back. I cannot emphasis enough the privilege I feel being able to experience a trip like this, and if you’re reading my blog feeling a little envious, my advice is: take a leap of faith and book a ticket somewhere and see what the world has to offer. You won’t regret it, I certainly haven’t. I wish you a safe & uneventful journey back home. Take care. D.
Yes… all very well if you don’t have kids. The ol’ African rip-off, eh? It does get a bit tiresome. Not everyone is on a two week holiday loaded with money to throw around. And it’s not so much about the money as the feeing of being fooled by a cheat. Charity’s one thing; theft by deceit quite another. I think there was also nice comments to write about kasubi tombs not only complains,Guides really play a big role to bring that place back to life despite its sorry state,what do you think was worthy an informative tour of almost two hours if you think ten thousand shillings was a lot for a guide which you even never paid? remember ten thousand is equivalent to three$, What will you say if you visit any of the National Parks in Uganda where you must pay 40$ for entrance and guide for 25$?! Africa is fed up of such people who come to visit and at the end you make such tarnishing comments! You missed my point entirely. I have no problem paying a guide. I just want people to be upfront. There is nothing worse when you live in a place for four months where people are always ripping you off because they think it is ok to do it. For your information I visited five national parks in Sri Lanka last year was more than happy to pay for the entrance fee and tip the guides. This was a personal account, I am entitled to my opinion. It doesn’t mean everyone will share the same experience as me.